Staff Fest t-shirts are being sold through May 14 with some available at the event; bring $8 exact cash only or checks payable to Emory University. 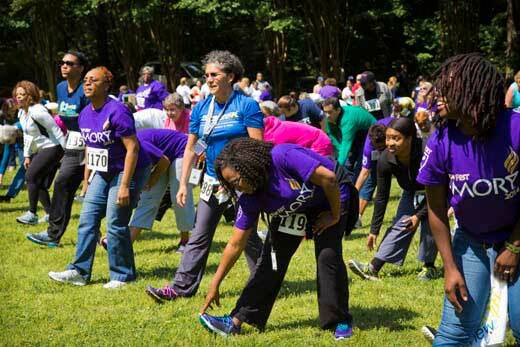 This year's Staff Fest, Emory's annual employee appreciation day, is set for Friday, May 15, featuring new hours, a new time and route for the Fun Run/Walk and hot dogs added to the refreshments. Celebrated with the theme "Embracing the Past...Creating the Future," this year's event will be held from noon to 3 p.m. The location is still the Quad and the main event continues to feature games, music, dancing and other popular activities like the climbing wall and caricature drawings. The theme was coined by Sonia Delbridge in Research Administration, winning her a free Staff Fest t-shirt and a $25 gift card to Emory's Barnes and Noble bookstore. In a change from previous years, the two-mile Fun Run/Walk relocates from Lullwater Preserve in order to begin and end on the main part of campus. Instead of separate events for walkers and runners, everyone will participate together this year on a route that steps off at 11 a.m. at Asbury Circle, then goes through campus, ending on the Quad for the rest of Staff Fest activities. Participants are asked to register by May 13 and check in by 10:45 a.m. on Friday. A variety of prizes will be awarded. Also beginning at 11 a.m. on the Quad is the volleyball tournament. Up to 20 teams on two courts can be accommodated. Teams are limited to 10 players per team with no more than six on the court at a time. The refereed games will continue until 2:30 p.m. Prizes will be awarded for first, second and third place teams. Only team captains need to sign up for their team with one registration per team. Light refreshments including chips, ice cream, popcorn and Coca-Cola products will continue to be served at Staff Fest; added this year will be hot dogs, both beef and vegan. While Dasani bottled water will be among the Coke products offered, employees are encouraged to bring their own re-usable water bottles to Staff Fest this year in support of Emory's sustainability initiatives and the effort to decrease the number of plastic water bottles on campus. Hydration stations will be set up on the Quad. Several vendors, including United Way, Emory Alliance Credit Union, TIAA CREF and Vanguard, are donating free water bottles, which will be distributed with the Staff Fest t-shirt sales while quantities last. For the past two years, America To Go (ATG) has shared samples from its food vendors. This year, ATG will not provide the tastings but will have a table set up in Emory Information Central. Emory Information Central is a series of tables set up on one end of the Quad where various services, departments and Emory-affiliated vendors provide information on what they have to offer Emory employees with fun contests and even some swag. The Employee Council is instrumental in supporting Staff Fest, sponsoring the annual theme contest. This year, the Council is also sponsoring a food drive during Staff Fest. Barrels will be set up on the Quad for employees to bring any non-perishable items to donate to support the Atlanta Community Food Bank. In the event of rain, Staff Fest will move to the Lower Level Terrace of the Dobbs University Center for refreshments only. Also, employees are reminded that Staff Fest is for current staff and retirees only. Family members will not be admitted.